Last January, late one afternoon, I got a totally unexpected call. 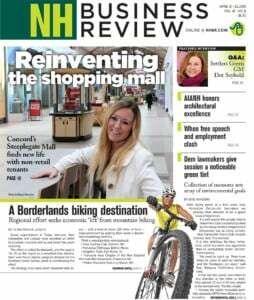 The caller ID said “New Hampshire Business Review,” and I have to admit I considered letting it go to voicemail. When I answered, I was stunned to hear editor Jeff Feingold on the other end, telling me I had been selected as an Outstanding Woman in Business. I was shocked, and immediately pained. I didn’t even know I had been nominated and, being an accountant by training, I am not someone who yearns for the spotlight (accountant + spotlight usually means jail time is coming …). In fact, truth be told, I am being forced by our VP of marketing to write this article today. When I spoke with Jeff, there was a moment of great awkwardness. I experienced a rare moment of speechlessness, and Jeff had to repeat himself. But that was nothing compared to the next 20 minutes, when I was handed copies of the letters that had been submitted on my behalf, especially the ones written by my teenage daughters. It was pretty emotional – not unlike reading a great financial statement. No doubt this year’s winners are experiencing their own moments of “shock and awe” at being selected. This recognition means something. Prior to last year, I had always considered this list to be a good shopping opportunity for potential board members (thank you, Dianne Mercier and Beth Roberts. Beware, this year’s recipients.). It’s a chance to learn about smart women in fields that are different from your own, who have contributed a great deal, and who are generous enough to share their wisdom. It also is a wonderful opportunity to get to know the different paths that these women have taken in their careers. There is no one right path and very few straight shots to the top, especially for women who are balancing family and career. Yet I believe how we get to where we are, and the choices we make along the way help ground us and set the culture in the organizations we lead. I don’t know if we need to “Lean In,” as Sheryl Sandberg says, lean out, or not lean at all, but I will say that when I attend CEO meetings in my industry, there’s never a line for the women’s room. That is changing, because women should be in leadership roles and in boardrooms. In fact, research shows that companies perform better when they have more gender equity in top positions. Awards like this one serve to help remind women that their leadership matters, for their organizations and for others. As a mother of teenagers it is sometimes amazing to me that anyone might actually want to hear what I have to say. I’ve had a few opportunities this year to share some thoughts – with other women in leadership positions and with young women who are just starting their journey. It’s been humbling, and surprisingly fun. I’ve met some smart people and learned some great lessons. Turns out it wasn’t so painful after all. My congratulations to Linda, Pamela, Sandra, Renee, Sandra and Marty. You are obviously doing great work. Be proud. And share your story. You may not know how or to whom, but your impact will be felt. Justine Vogel, president and CEO of RiverWoods in Exeter, was a 2013 Outstanding Woman in Business.